Where is the Virginia Creeper Trail? 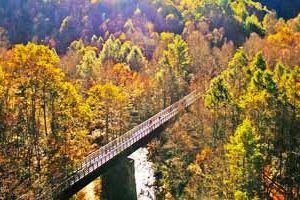 The Virginia Creeper Trail is located in southwest Virginia about 2 hours southwest of Roanoke, 3 hours north of Charlotte, NC, 2 hours north of Asheville, NC, 1 hour from Boone, NC, and 2.5 hours northeast of Knoxville, TN. When did the last Virginia Creeper train run? The Virginia Creeper Trail is 34.3 miles from the trail head in Abingdon to Whitetop Station. How long will it take me to ride the entire trail? The average time is about 5.5 hours, including a few stops along the way to enjoy the scenery and a bite to eat. From Whitetop to Damascus – 17 miles or so, you can count on approximately 2.5-3 hours and the ride from Damascus to Abingdon is another 17 miles and will take about 2.5 hours. What is the elevation at Whitetop Station? The elevation at Whitetop Station is 3500 feet, dropping down to 1900 feet in Damascus. Can I bike from Abingdon to Whitetop? Yes, you can!! And, many do! The grade is less than 5%. The Welcome Center is located at the trail head in Abingdon at 300 Green Spring Road. It is open in-season, March to November, Thursdays through Mondays, 11am to 6pm. The locomotive on display is the last steam driven engine on the Creeper and makes for a great photograph. Bottled water, Creeper Trail merchandise, O. Winston Link photographs and restrooms can be found inside, as well as knowledgeable staff that can provide additional information. A new picnic shelter is also available. Where can I get a map of the trail? The trail is owned by the towns of Abingdon and Damascus and the US Forest Service, and also passes through private property. What is the trail surface? Crushed limestone and cinder left over from the rail days, which is hard-packed in most places. How do you keep the trail so well-maintained? 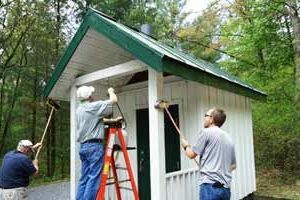 The maintenance of the trail is a joint partnership between volunteers of the Virginia Creeper Trail Club, the towns of Abingdon and Damascus, the USFS and users like you! Please do your part to keep the trail clean and safe for all! Nothing! Access to the trail is completely free. There is a charge for shuttle services and to rent bikes from local bike shops and outfitters. Of course! Though we do encourage you to look it over — especially tires and brakes — before heading out on the trail. 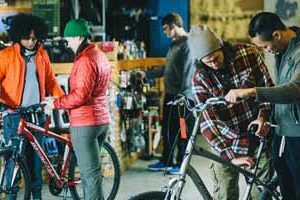 The trail is fortunate to have terrific bike shops and outfitters in both Damascus and Abingdon. Reservations are recommended. See bike shops and outfitters. Helmets are not required but we STRONGLY recommend them. What are the most important safety guidelines I should follow? When passing other riders, those on foot or equestrian traffic, SLOW DOWN and always pass to the left, while calling out “passing on the left” or sound a mechanical warning like a bell. Most of the minor accidents along the trail can be completely prevented by following these simple steps. Though helmets are not required, they are highly recommended and are standard issue with bike rentals. Bring your own if bringing your own bike. Walkers should keep to the right on the trail. Always yield the right-of-way to horses and their riders. Do not approach suddenly from behind or at a high speed. ALWAYS, ALWAYS call out or sound a mechanical warning when passing horses and their riders. Travel single file and keep to the right except when passing. Keep your speed under control, especially when traveling downhill and keep your eyes on the trail and trail surface, watching out for oncoming traffic, rocks, washouts and other hazards. Due to the very curvy nature of the VCT, please don’t stop in the trail traffic lanes. Pull off to the side when taking a break or enjoying the scenery. Obey all stop signs at road crossings. Vehicular traffic may not yield. Know where you are on the trail by observing the mileposts and trestle numbers located at each end of the trestles on the top rail. Due to the very mountainous terrain, cell service is not available along much of the trail. In the event of an accident or sudden illness, dial 9-1-1 with your location (nearest mile marker and/or trestle number). If cell service is not available, ask another trail user to go to the nearest house or station to call emergency services. We encourage all trail users to be aware of their general location, making use of the mile markers along the way. As cell service is not available at all points along the trail, you may have to rely on passersbys to summon help. In-season, there are bike patrols along the trail though their availability can be limited. Defibrillator (AED) devices are located at Whitetop Station, Green Cove Station, Alvarado Café/Alvarado Station and the Welcome Center at the trailhead in Abingdon. Basic first aid supplies can be found in these locations as well. What is the proper “trail etiquette”? As the trail traverses private and public property, we ask that all users exercise respect and courtesy. Please do not block gates or park on the trail. Please pack out ALL litter, including animal waste and cigarette butts. Leave the trail better for you having visited. Be courteous to all users…the Creeper Trail is a shared-use trail and can be a wonderful experience for all. Are there bathrooms along the trail? I’m “mobility-challenged”…how can I use the trail? Special needs/special use buggies that can comfortably fit an average-size adult along with adult tricycles are available for rent at Creeper Trail Bike Rental & Shuttle and the Bicycle Junction in Damascus. In addition, although the trail is for non-motorized traffic only, all ADA approved chairs, including battery-operated ones, and ADA approved scooters are welcomed on the trail anytime! However, golf carts and electric bikes (“e-bikes”) are not. Are e-bikes permitted on the VCT? At present, the USFS does not permit electric bikes on Forest Service property. Approximately half of the VCT runs through USFS property therefore e-bikes are not currently allowed on any portion of the trail. When is the trail closed? Your bicycle and helmet if you’re not renting. A light jacket in the cooler months. And, it’s always a good idea to have a light snack and water when you’re out as well. We expect cyclists and walkers/runners to yield the right-of-way whenever possible to equestrians. We expect you to dismount and lead your horse when crossing all bridges/trestles. This is not just a safety issue for other trail users but for you and your horse as well. Proceed at a slow pace down the trail. Please make every effort to remove, or kick to the side, all droppings from your horse. This is a courtesy to all users – and a safety issue! For the wide-range and wonderful lodging options in the area, please go to VisitAbingdon or VisitDamascus. How many trestles are on the trail? There are 47 trestles along the Creeper Trail corridor. 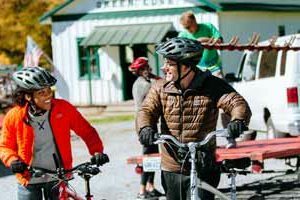 Who is the Virginia Creeper Trail Club? 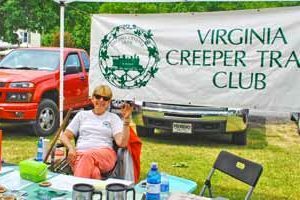 The Virginia Creeper Trail Club (VCTC) is a 501(c)(3) nonprofit volunteer organization dedicated to the maintenance and preservation of the Creeper Trail corridor. The VCTC partners with other trail stakeholders to support a safe and enjoyable experience for all trail users. We partner with the towns of Abingdon and Damascus and the USFS to provide general maintenance, including clean-up, small and large project labor, funds to purchase supplies and materials, interpretive signage, volunteers who provide educational programming and many other services and funding that provide for an enjoyable and safe experience for thousands of annual users. Becoming a member is easy – and important — because it demonstrates your commitment to preserving the trail. Go to Join/Renew for information on individual ($10 annually), family ($20 annually) and lifetime ($100) memberships. How are the proceeds from memberships, donations and merchandise sales used? The proceeds from membership dues, merchandise sales and donations are directed back into the trail in the form of needed supplies, building materials, and partnership requests. How do I donate to help with the maintenance and preservation of the Virginia Creeper Trail? Does the trail need volunteers? Absolutely! See Volunteer Opportunities for a list of current needs. Who is the Trail Advisory Board? 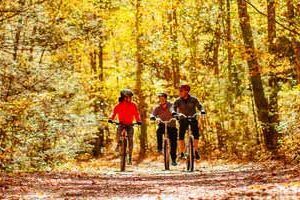 The Trail Advisory Board (TAB) is made up of members from the Towns of Damascus and Abingdon, the US Forest Service, Washington County, adjacent property owners and the Virginia Creeper Trail Club. TAB meets every other month to address concerns and questions from trail users, stakeholders and TAB members. TAB welcomes your input and questions. Email your suggestions, questions or concerns to the VCTC, and we will bring them to the board’s attention at the next scheduled meeting. I’m staying in the area for several days. What other activities, events and attractions are available? You may need more than several days to experience all that our area offers! For current attractions and events, we encourage you to go to VisitAbingdonVirginia.com and VisitDamascus.org. Where can I camp, and, where can I NOT camp? No camping is allowed on private property at any time. There is no camping between Abingdon and Damascus except in Alvarado Park where one night is permitted. Camping is allowed in the USFS section of the trail provided you remain 100′ from the trail (and the bank of any stream) and are not on private property.